Farm Tourism is set to become a low impact toursim industry at Mission Beach. After the dramatic effects of Cyclone Larry, Fruit Forest Farm improved production systems designed to establish sustainable orchards. Having improved the quality and quantity of the yield and working adjacent to World Heritage listed rainforest, owner Peter Salleras is now working towards food tourism as a value added product and additional source of income. Peter is planning on developing the first fruit farm tour in the area. His habitat friendly farm maintains a commercial property but also has a high emphasis on the preservation of surrounding rainforest further adding to the appeal for visitors to the region. Peter contributed many articles for the local environment newsletter, the Mission Beach Bulletin, where he outlines his innovative approach to farming in the Wet Topics. The Cassowary friendly pig trap (left) was designed by Peter as far back as the early nineties and yet Cassowaries are still being trapped and dying in cages set for pig control. 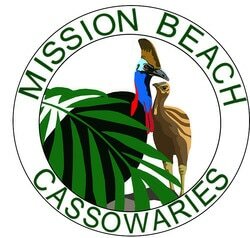 Peter was presented with the 2009 Cassowary Award for World Heritage Neighbour.